I LOVE THIS MOSCATO, Just the right balance and taste!!! I've tried a lot of them and I always come back to this one! Great price to!!!! Thank You Lucky Duck!!!!! Yes this is awesome wine with an awesome price, it compares to the $20 bottle I used to buy. My favorite of all the Lucky Duck wines thus far! Just bought this! Can't wait to try! 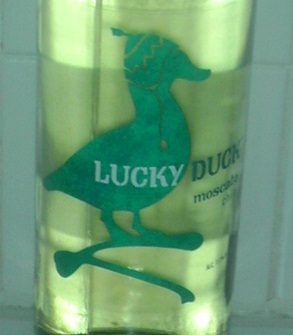 My husband and I are hooked on Lucky Duck Moscato! $3.97 at our local Walmart, so it's a great deal. We're on a tight budget and we're always looking for a good wine at a low cost... we have a few favorites but always come back to this one. Great balance of flavor and sweetness. This moscato is amazing I will definitely be buying this again what a great taste !!!! Just got it on a whim at wal-mart for $2.97. Got a Riesling mix and this one. Was expecting junk taste but it turns out it's pretty drinkable. Wow yeah, just tried it and I'm surprised, $3.47 at walmart, LOL... very good and light. Was worth the try. This wine is crap. I'll have to keep splurging on my 15.00 Electra Moscato. Just had this at a wedding, it's great! Really delicious, light, not overpoweringly sweet, could easily drink a whole bottle!! Also, I'm alcohol intolerant to a lot of wines, but not this one.